An article from Vermont offers an unusually detailed and complete report on a Public Service Board hearing about noise at a proposed wind farm in Lowell. I highly recommend it. The article summarizes the testimony of two noise experts, each of whom was proposing what they felt was a proper conservative noise limit; the article presents each approach quite well, and gives a good sense of the judgment calls that regulators are being asked to make about wind farm noise. Les Blomberg urged a 35dB standard at property lines, which would help keep noise levels low enough for folks to put a chair in the yard and relax. He used an EPA technique to suggest that turbine noise should be regulated to a lower sound level than other noise sources. Ken Kalinsky proposed a 45dB standard outside the home, which would protect against sleep disruption, and not limit outdoor conversation, though may interfere with quieter outdoor activities such as listening to songbirds. He said that 45dB is more conservative a limit than those used in many other places, notably the World Health Organization standard for protecting health. Now go read the whole article! Great article in the New York Times on the strides made at Muir Woods, just north of San Francisco, in restoring natural quiet. 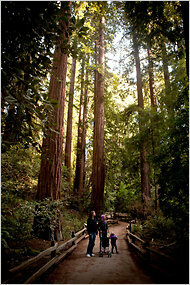 At times, deep within this vaulted chamber of redwoods, it is almost quiet enough to hear a banana slug slither by. For the National Park Service, that stillness is as vital a component of the site as the trees’ green needles, or the sudden darting rays of sunlight. A decade after the agency resolved to restore natural sounds to this park in a metropolitan area of seven million people, managers at Muir Woods, in Marin Country just north of San Francisco, have made big strides in vanquishing intrusive noise. Now the background sounds are dominated by the burbling rush of Redwood Creek, the soft sibilant breeze that stirs the redwood branches, the croak of a crow. Much more in the full article, including summary of National Park Service research on the effects of moderate noise on animals, and the recent Grand Canyon noise management plan. Renewable Energy World has just published a commentary I wrote, urging wind industry professionals to reassess their current one-size-fits-all approach to community noise standards. You can read it in full, with links to sources and comments from others, on their site. They’ll be seeding it into their email newsletters during the week, likely triggering a few waves of readership and comments. The wind industry is at an important fork in the road regarding community noise standards. After years of successfully using relatively small setbacks in farm and ranch country, recent years have seen a surge of noise complaints, troubling annoyance-level surveys, and widespread fear of new wind development. Though sound levels of 45-50dB have been taken in stride by many, even most, places where early industrial wind development took place, it’s becoming apparent that for some types of communities, sound levels of even 40dB are triggering high levels of community push-back. The industry’s first responses to this emerging problem have been counterproductive: discounting the prevalence of complaints, vilifying acousticians seeking to understand the shift, and most fundamentally, insisting to county commissions nationwide that “widely accepted” community noise standards that have worked elsewhere are applicable everywhere. It’s high time that forward-looking industry insiders take the lead in forging a more flexible, collaborative relationship with communities, acknowledging that the noise tolerance we are used to is not universal: some rural regions are far less amenable to moderate, yet easily audible, turbine noise. Companies that accept this fact — rather than ignoring or fighting it — will build corporate reputations that could make them the go-to developers across much of rural America. 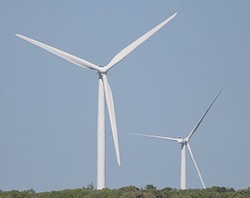 The town of Falmouth, Massachusetts continues to grapple with noise complaints from a large number of landowners living within a half mile or so of the two wind turbines erected at the town Wastewater Treatment Facility. Acting Town Manager Heather Harper, who’s been the town’s point person on seeking solutions since the first turbine began operations just about one year ago, is currently dealing with fallout from the State DEP expressing concerns about the analysis presented by the town’s formal noise study, as well as tensions generated by a challenge to the initial permits granted to erect the turbines. Harper says that while she anticipated some negative reactions to the turbines, the intensity of the response has surprised her. When the project was proposed, and throughout the planning process, local support was solid. “Many of the neighbors did participate in that process,” Harper notes in a recent article in the Falmouth Enterprise. The town is exploring options for reducing the sound at times, but doesn’t want to jeopardize the value of the turbines to the town, in generating electricity for municipal buildings. The neighbors rejected a proposal from the town to shut the turbines down between midnight and 3am in high winds, saying that noise issues were problems outside this time range. They are suggesting that permanent noise or wind monitoring stations be installed, that could trigger curtailments in conditions when noise is most bothersome (no details were offered in the Enterprise article about what these conditions may be). Christopher Senie, the neighbors’ lawyer, admits that there is no perfect solution, but they want to find a middle ground that minimizes neighbor’s negative experiences while making the turbines beneficial to the town. Meanwhile, the Cape Cod Commission has approved new wind farm regulations for the region, which includes setbacks of 10x the rotor diameter, which for the Falmouth turbines would have amounted to 2700 feet. While noise problems can persist beyond this range, most complaints about chronic noise impacts come from residents under a half mile away. The CCC proposal also includes a so-far fairly vague provision that would allow closer siting if a noise study suggests sound will have “minimal impacts” to nearby residents; the plan is that future technical bulletins will clarify what that means. Unbeknownst to most of us, a long-term National Forest Service approach to managing roads on its millions of acres of non-wilderness lands has been waiting for activation since January 2001, when the Forest Service finalized a plan for the long-term management of their oversized and under-maintained road system. That plan basically directed the agency to identify an ecologically and fiscally sustainable minimum road system that would meet resource management and recreational access needs. The plan projected that the agency might reduce the overall road system by more than 30%, and that as a result “unroaded” acreage might increase by up to 15% nationally. Wildlands CPR fills us in on the details with this web post and a real nice pdf version of their magazine feature on the story. A combination of political neglect and other factors has meant that even as the “minimum road system” goal remained on the books, and was part of the Travel Management Plan process that many forests engaged in over the past decade, implementation of the idea has never happened. Now that has changed, with the release in late 2010 of a directive from the Forest Service Chief. The guidance memo directs all national forests to identify, through a science-based analysis, an ecologically and fiscally sustainable minimum road system by 2015. In addition to the five years it will take to conduct this analysis nationally, it will likely take decades to actually implement the minimum system on-the-ground. But the plans developed through this process will, over the long-term, create a blueprint for future road maintenance and decommissioning investments, including Legacy Roads and Trails Remediation Initiative funding. For those interested in large landscape connectivity for wildlife, this initiative presents an opportunity to reduce road densities as well as protect and restore linkages and core habitat. For those interested in clean water and fisheries, it is an opportunity to improve water quality and watershed health. And for those interested in fiscal responsibility, it is an opportunity to identify a road system that the Forest Service can afford to maintain. Senator John McCain has introduced legislation that would derail the National Park Service’s recently-released compromise plan to reduce noise levels in the Grand Canyon. McCain’s initiative, apparently included in an amendment to another bill (details are sketchy so far, with nothing on McCain’s website so far), would declare that keeping half of Grand Canyon National Park relatively free of noise from air tours is good enough. By contrast, the NPS proposal, which increased the total number of tourist flights allowed but concentrated them in smaller flight zones, would keep two-thirds of the canyon free of any aircraft noise (including commercial jets and non-tour private aircraft) for most of the day. McCain seeks to codify what has been the Park’s modus operandi for the past 17 years, a 50% protection standard that was achievable without making major changes. That interim approach was adopted while Park staff, environmental groups, and air tour operators attempted to come to a consensus on how to move forward. While the NPS does not and cannot regulate commercial overflights, the sound from high-flying jets does impact the canyon, and the NPS included these sounds in its planning of air tour routes, so as to keep aircraft noise inaudible for 75% of the day in the “quiet” parts of the park (of course, allowing aircraft noise for 25% of the day hardly creates an experience of solitude…but this is part of the compromise that wilderness advocates are being asked to accept). By not counting commercial flights in the total noise budget of the Park, McCain is rolling things backward. The McCain approach would also do away with two of the Park Service’s key innovations: seasonal shifts of air tour routes, so that different parts of the park are quiet at different times of the year, and most importantly, the no-fly period that would keep the canyon truly quiet for an hour after sunrise and an hour before sunset. This short story from Australia neatly sums up the divide in many communities over wind farm development. 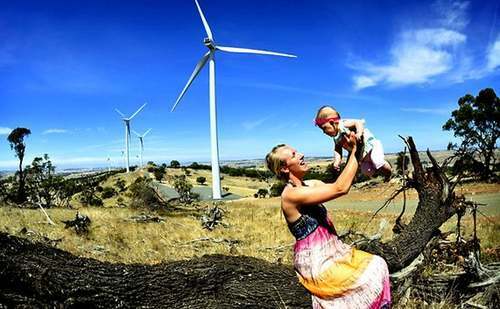 Black Springs resident Kerry Heinrich (above) is happy to have wind turbines in her backyard. At yesterday’s launch of the Waterloo wind farm – 30km from Clare – Ms Heinrich said the 37 wind turbines created only “background noise”. It all comes down to how much, if any, background noise someone is ready for, it seems. Time will tell whether the homes in this particular community are close enough to the turbines to cause ongoing problems, or only occasionally audible noise. The biannual Wind Turbine Noise conference, sponsored by the Institute for Noise Control Engineering Europe, is being held from April 11-14 in Rome. This week, conference organizers announced the line up of papers that will be presented, and as always, it looks to be a greatly informative few days. I can hardly wait until the proceedings CD is prepared, ordered, and arrives on my doorstep! “In Holland, there’s hardly any project that doesn’t get delayed,” said Michiel Muller, the wind unit manager of Ecofys, a research and consultancy firm on sustainable energy, who is not connected with the Urk project. Across Europe, each installation faces a slew of hurdles, starting from the required Environmental Impact Assessment to regulatory approvals by often more than a dozen authorities. It takes an average of 55 months to wade through the bureaucratic tangle before work can begin, the European Wind Energy Association said. Of some 200 wind energy projects studied in 2007-8 in Europe, 40 percent were ensnared in lawsuits, and 30 percent more faced slowdowns because of local resistance or questioning from nonprofit environmental groups, the association said. It had no figures on how many projects were killed before they got started. Down East magazine, a Maine institution, has published a series of stories on wind power in Maine, with enough detail to be valuable to people in any rural state who are trying to find the proper balance on wind development. The series includes in-depth articles on the University of Maine’s leadership in developing floating far-offshore wind farms and on controversy surrounding the potential for many ridgetop wind farms in the relatively wild mountains of western Maine, and an editorial noting the quick and fearful reactions of many communities to just the thought of a new wind farm. The wildlands article makes the case for protecting Maine’s highest ridgetops (over 2700 feet) from development, and focusing on smaller-scale, distributed alternative energy generation, including solar as well as wind, built closer to existing power infrastructure. Make that three outhouses. DeepCwind’s goal is to have three such wind farms bobbing twenty to fifty miles off the Maine coast and generating enough energy to power three million homes by 2030. It’s a breathtaking idea, and still it doesn’t fill the frame that has been drawn by Habib Dagher. He envisions Mainers converting to electricity to heat their homes and power their cars (the cost makes no sense now, he concedes, but it will in two decades, given the price increases predicted for fossil fuels) and the state becoming the Silicon Valley of offshore energy. Towers, blades, and other components will be manufactured right here, using technologies and materials pioneered by the University of Maine’s AEWC Advanced Structures and Composites Center, which he founded and directs. This legal challenge is similar to those mounted against Navy mid-frequency active sonar training, in that they are designed to assure that the behavioral impacts of seismic survey noise are considered, and that Incidental Harassment Authorizations are issued, with conditions meant to avoid any injury of animals, and minimize behavioral changes. The MMPA and ESA clearly require careful assessment and permitting of any activity that may negatively affect marine mammals or endangered species. What is unclear, though, is how (if at all) oil and gas exploration activities might change after going through these proper legal challenges. The US Navy now prepares full Environmental Impact Statements for all of its active sonar training areas, and receive IHAs from NOAA, but this legal compliance has not reduced their training activities or succeeded in putting any biologically rich areas off limits–in effect, NOAA has issued the permits after long official assessments that the activities have no significant impacts. LIkewise, the oil and gas industry does have procedures in place to reduce sound output when animals are (very) close, and research into the behavioral effects of noise exposure at greater distances (lower sound levels) is ambiguous, though concerning. See this earlier post about AEI’s work in this area, assessing research about behavioral impacts of moderate noise, including seismic. The rhetoric from the litigants is surprisingly personal, implying that Gulf of Mexico exploration activity is being ramped up by this administration. “Under Salazar’s watch, the Department of the Interior has treated the Gulf of Mexico as a sacrifice zone where laws are disregarded and wildlife protection takes a backseat to oil-company profits,” said Miyoko Sakashita, oceans director at the Center for Biological Diversity. (See press release) What is unstated, and may in fact be more to the point, is that the Gulf has been a sacrifice zone for decades. The fact is that these animal populations in this truly industrialized sea have been living with seismic exploration, drilling, and lots of ship traffic for many many years; some populations, including sperm whales, appear stable. While some may suggest this reinforces NOAA’s current stance that the activities do not cause any significant impact on wildlife, and others (including AEI) say it’s clearly long past time to consider the cumulative and long-term impacts of this activity on marine life, the villain is not Ken Salazar. It’s our continuing addiction to oil, pushing us to search in ever deeper and more hazardous waters to fill our boundless needs. A group in Maine has petitioned the state Board of Environmental Protection to amend the noise rules in the state Site Location Law to set lower limits for wind farm noise than for other sources of community noise. The group, the Citizen’s Task Force on Wind Power, is formally asking the state to consider a question that has become central to siting controversies nationwide: is the nature of wind turbine noise different enough from road or factory noise to warrant lower noise limits? The BEP will hold public hearings to consider the question. The prevalence of amplitude modulation. The pulsing quality to the sound, rising and falling slightly in loudness at about once a second, adds to its noticeability and annoyance (this is often related to the presence of a wind shear, or higher wind speeds at the top of the turbine blade rotation than at the bottom). The low-frequency character of turbine noise. Separate from the controversial question of direct health effects from exposure to moderate levels of infrasound, wind turbine noise is weighted toward lower frequency audible sound as well, which travels farther than higher frequencies, penetrates homes better, and is not fully represented in A-weighted dB measurements. The unpredictable 24-hour nature of the sound. Other common community noise sources quiet down at night, often becoming totally inactive, rather than continuing at the allowed 45dB. Large difference of turbine noise and natural ambient at night is disruptive. Night time wind farm noise at current 45dB standard can easily be 15-25dB louder than quiet rural ambient noise level. Currently, state regulators are relying on the state’s generalized community noise standards in approving wind farms. According to Cynthia Bertocci, an analyst for the BEP, a public hearing will be held to address the petition to change the regs for wind farms, though a date has not yet been set. The Citizen’s Task Force proposes nighttime noise limits of 35dB at homes; while turbines would still be audible outside in many cases (night time ambient in rural areas is often 20-25dB, and sometimes even lower), noise inside should be minimal. This would like require setbacks of close to a mile. The Wisconsin legislature has moved quickly to enact most of newly elected GOP governor Scott Walker’s job-creation bills during a special session he called after his inauguration, with one glaring exception: Walker’s proposal to increase wind turbine setbacks from 1250 from homes, to 1800 feet from property lines. As noted in this earlier post, and in a more detailed commentary on the Renewable Energy World website, Walker’s proposal seems to AEI to be a step in the right direction toward forging a new social framework that will actually support the long-term success of the wind industry, by helping avoid long, costly siting debates, lawsuits, and property-value claims. The proposed larger setbacks would come along with provisions allowing closer placement of turbines if the company works out an agreement with nearby neighbors. According to the Milwaukee Journal-Sentinel, negotiations are underway to perhaps come up with some sort of middle ground between the existing regulations and Walker’s proposal, with leaders of the GOP majority sharing Walker’s concerns that the 1250 standard is insufficient. UPDATE, 2/11/11: The Wisconsin legislature held a hearing to consider suspending the statewide wind farm regulations adopted by the state PSC last year, scheduled to go into effect shortly. While the GOP-led legislature did not move forward with Governor Walker’s bill to increase setbacks to 1800 feet from property lines, they are considering revisiting the question. Listening for people crossing the border in Arizona? A “border watch group” in Arizona is proposing the installation of underground sensors that will listen for the footsteps of illegal immigrants crossing from Mexico. They’ve apparently gotten the ear of an Arizona state legislator, who says he’s earmarking $5 million of existing funds to install a 5-mile prototype of the system. A new study reveals yet another family of ocean life previously thought to be deaf actually use sound to avoid potentially dangerous areas. It’s the latest fascinating study from a collaboration between British and Australian scientists that has been revolutionizing our understanding of the role of acoustic ecology in reef habitats. In this study, crustaceans that feed on plankton avoided reef sounds; such reefs are home to fish that would enjoy a crustacean lunch. The National Park Service has released its proposed air tour management rules for the Grand Canyon. Key features of the plan include increased flight altitudes near North Rim overlooks, reducing flights in Marble Canyon, moving routes away from some key visitor use areas, and establishing an hour-long flight-free period for an hour after sunrise and an hour before sunset. This last change will be especially appreciated by backcountry hikers and river-runners, for it provides two hours a day of true extended natural quiet, at the times when the soft, rich light brings the canyons walls most subtly and dramatically alive. The proposal caps nearly 25 years of work, initiated in the wake of a 1987 congressional mandate to come up with a plan that “provides for substantial restoration of the natural quiet and experience” of the Canyon. The proposal would allow slightly more flights than are currently operating, but would largely concentrate them in one long and one short flight loop. The plan is now available for download and public comment through early June. The NPS press release notes that the plan should increase the area of the park experiencing substantial natural quiet for most of the day from just over half to close to two thirds. 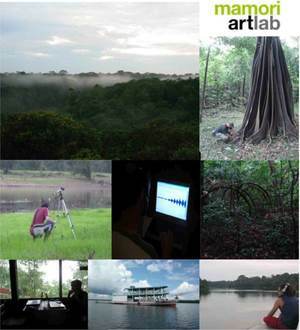 The objective measurement standard used by the Park Service defines substantial natural quiet to mean that in these areas, no aircraft will be audible for at least 75% of the day; so, you might hear a plane for up to one minute of every four, or fifteen minutes of each hour, though undoubtedly there will be some areas of the park far enough from the flight routes that the noise will be very faint and far less common. Once we have time to read the full Draft EIS, it may become clearer whether there are some areas in the park that are virtually free of air tour noise (commercial airline flights regularly pass directly over the park; the plan does not suggesting shifting these routes). The busiest year on record, 2005, saw 57,000 air tour flights provide birds-eye-views of the Canyon to over 400,000 visitors annually; the new plan would allow up to 65,000 flights annually, and up to 364 flights a day, 50 more than the busiest day on record. Initial reactions from the National Parks Conservation Association and the Sierra Club, both of which have pushed for flight regulations, has been supportive. Update, 2/4/11: Steve Bassett, president of the U.S. Air Tour Association, characterized the National Park Service’s recommendations for the Grand Canyon as “unconscionable” and the document as “designed to drive the industry out of existence.” His objections are largely centered on the requirement that within ten years, all planes must be modern low-noise aircraft. He also objected to the annual cap of 65,000 flights, claiming that the annual number of “possible flights” is now 94,000 (presumably this totals all current operators, if they all flew the maximum number of flights possible per day; in fact, as noted above, the busiest year on record saw a demand for just 57,000 actual flights). 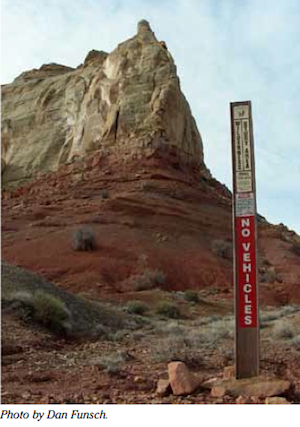 Update 2/6/11: Good article from Las Vegas newspaper, stressing the role of Grand Canyon tourism as part of what Vegas visitors want to experience, often by air. 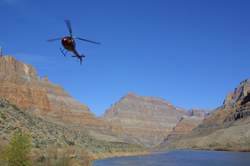 See earlier AEInews coverage of Grand Canyon overflights here.